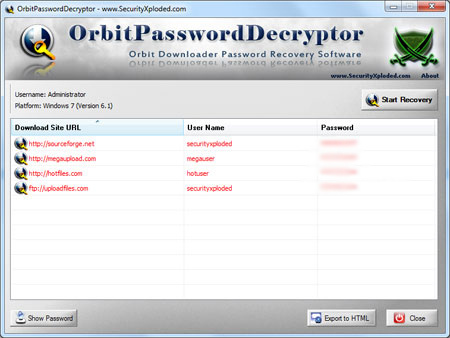 OrbitPasswordDecryptor is the FREE software to instantly recover premium account passwords from Orbit Downloader. Orbit is one of popular downloader software that simplifies and automates downloading file from many shareware and premium download sites such as Rapidshare.com, Megaupload etc. OrbitPasswordDecryptor helps in quickly recovering all these stored premium account passwords by Orbit Downloader. Instantly recover premium account passwords from Orbit Downloader. ...... It presents both GUI as well as Command-line interface in one tool making it more handy & easy to use. * Instantly decrypt and recover stored premium account passwords from Orbit Downloader. * Recover password of any length & complexity. * Command line Interface make it perfect for Penetration Testers. * Easier and faster to use with its user friendly cool GUI interface. Orbit Password Decryptor works on most of the Windows platforms starting from Windows XP to latest operating system, Windows 7. Qweas is providing links to Orbit Password Decryptor 1.0 as a courtesy, and makes no representations regarding Orbit Password Decryptor or any other applications or any information related thereto. Any questions, complaints or claims regarding this application Orbit Password Decryptor 1.0 must be directed to the appropriate software vendor. You may click the publisher link of Orbit Password Decryptor on the top of this page to get more details about the vendor.